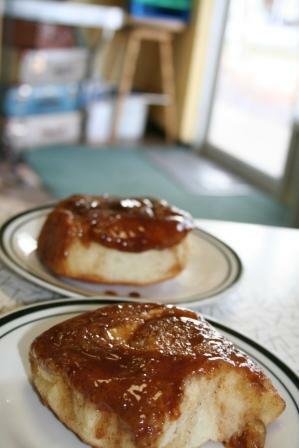 I have it on good authority (my own) that the cinnamon buns at the House of Heart Cafe rock. One of the great things about having a business with a partner that lives an hour and a half away is that we’re always looking for places “in the middle” to meet. 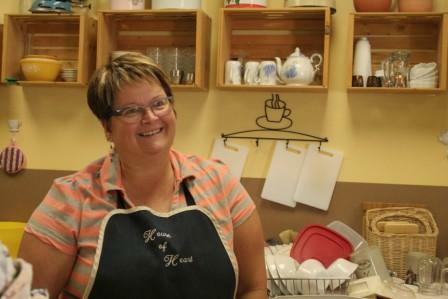 This particular time we decided to meet in Cabri at the House of Heart Cafe, where we had a coffee, a cinnamon bun, and a chat with owner, chief cook and bottle washer Paulette Gehl, where we learned all about the business she’s owned for the past 11 years. 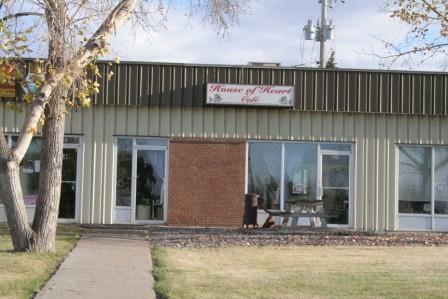 Discovering in the process that the House of Heart Cafe, located on Centre Street in Cabri, is really the heart of Cabri itself. Catering to the breakfast, lunch and coffee crowds, you’ll experience a down home feel that cozy and welcoming, not surprising when you learn that Paulette’s aim is to make everyone that enters the café feel like they were company entering her home, instead of customers entering her business. 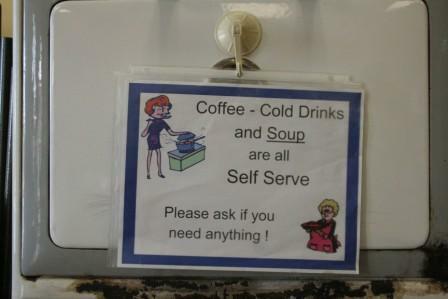 The “help yourself” attitude gives the House of Heart Cafe that homey feeling. Making a daily soup and sandwich special (the price of which includes dessert), and a hot meal each Wednesday, at the House of Heart there’s no set menu, something Paulette says people are okay with as long as what she’s offering is plentiful, tasty and reasonably priced. And if you don’t like what’s being served that particular day, no worries Pauline usually has something that will suit you in the freezer, thanks to the other side of House of Heart café, Paulette’s catering business. A growing aspect of House of Heart that’s mostly grown by word of mouth and has a faithful following among many of the communities in the surrounding area. She’s catered birthday parties, family reunions, and weddings that have seen her travelling to communities such as Kyle, Prelate, Leader and Swift Current. 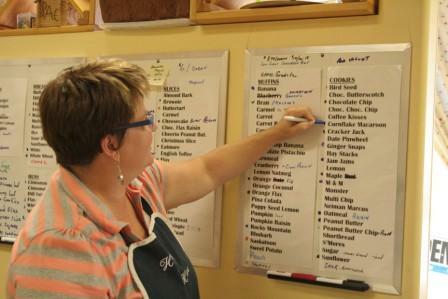 Paulette Gehl adjusts the inventory on her in-stock boards. But it’s not just big events that Paulette caters to, she also caters to the more mundane aspects of daily life in general with a freezer full of tasty treats that customers can take away with them the very same day. Just as we did when, with our meeting running late, both Elizabeth and I realized we had nothing on the go for supper back at our respective homes. Quickly scanning the boards that Pauline has set-up as her inventory control, we both steadfastly looked beyond the list of cookies and squares that were available, (the delicious cinnamon buns we had just eaten weighing heavily on our minds and waistlines) and instead pounced on some of Pauline’s oh, so delicious Hamburger Buns (buns literally filled with ground meat and cheese), to serve to our hungry hordes. (Which for the record were equally delicious). What’s really surprising about House of Heart though is the effort that Pauline goes to, to ensure that even those with food sensitivities and health issues are well taken care of. From vegan, to gluten-free, and diabetic-friendly items, Pauline says she’s seen it as a welcome challenge as a cook to try recipes that will allow more of her friends and customers to enjoy the same homemade dine-in and take-out experience, not to mention catering, as those without special food needs. While in this day and age, you might expect every coffee shop and café on the planet to offer free Wi-Fi service, House of Heart does not. Normally we would be disappointed, but it turns out that Paulette’s reason for not hosting Wi-Fi is a very noble one, because she actually wants people to take a moment out of their “connected” lives to reconnect with one another. Which is also why she keeps the café small, so that you can be sitting at one table, and chatting it up with other patrons (as we did) at the nearby tables. It also means that even if the place is near to full, someone will always slide over and make room. 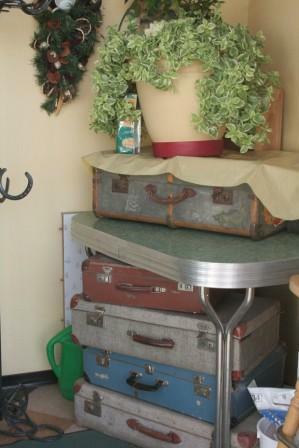 Paulette Gehl has created something very special in Cabri. With its down home feel and great tasting food, not to mention the friendliness of Paulette herself, it’s a great GoHere Destination to check out, next time you’re in the neighbourhood. How to GoHere: Cabri is located just off Highway 32 between Swift Current and Leader. Once in Cabri go past the Co-op to Centre Street, make a left and you’ll see House of Heart nestled in a strip of businesses on your left-hand side. If you’re not too sure where Cabri is – simply follow the map here. The bathrooms are clean and non-descript but the signage is pretty cute. Gotta Go? 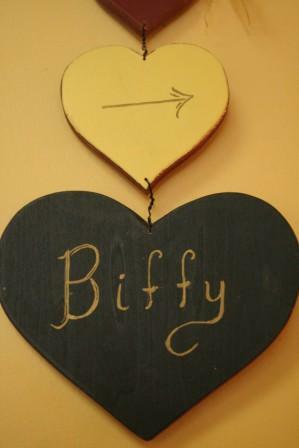 : There’s a perfectly serviceable and clean bathroom at the House of Heart, and good directions to get there. If you’re falling behind and haven’t had a chance to bake for that “thing” you have to go to, or even need to have a secret stash of Christmas baking to dip into, simply pick a random selection straight off Paulette’s boards of what she has in stock and call it a day. After all it IS still homemade. Who said it had to be made out of YOUR home? The hours aren’t set in stone at House of Heart. As her husband has an automotive business that Paulette also helps out with, and with the catering side of the business growing, Pauline occasionally has to be away from the café – but in general she’s open from 8:30 am -4:00 pm Mon-Thurs and 8:30 am – 2:00 pm on Fridays (which frees her up for catering). Pauline is actively looking to connect with her customers, and is planning on creating a Facebook Page sometime this winter. On it in addition to listing soups and specials of the day, and catering specials, she also hopes to be able to give people advance warning if for some reason she is unable to open or if she’ll be closing early. So look for it, and be sure to “Like” it. Thanks Paulette – the change is made!